In today’s litigious and regulation driven business environment, businesses have to treat their business records much the same way they do their equipment assets: with thorough management and precise attention to detail. This includes making all of the necessary provisions for the preservation and protection of documents and files. Failure to do so can lead to costly fines and penalties. Michigan Office Movers provides offsite records storage for businesses that need a secure solution for maintaining privacy and confidentiality for their paper records. Every container received into our records storage facility is assigned a bar coded control label. . Each time a carton is picked up, retrieved and refilled the label is scanned and the item’s status is updated within our inventory control database. This allow for the comprehensive tracking of your records inventory at all times. In short, you have a complete and thorough audit trail of your entire offsite inventory at the touch of your fingertips. After you’ve made a request, one of our professionally trained, screened, and bonded couriers will securely deliver your file to you in one of our alarmed and GPS tracked vehicles. We maintain a strict chain of custody during the pickup, retrieval and delivery phases to minimize the risk of your confidential information being compromised. 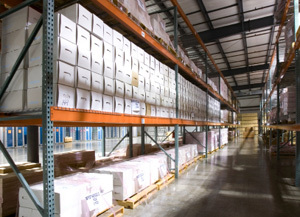 Your offsite inventory is available to you 24/7, 365 days a year. In addition to standard delivery, we offer our clients in Southern Michigan expedited 1 hour and 2 hour service to meet your most time sensitive requests. To find out more about how Michigan Office Movers’ offsite record storage solution can help you better manage and preserve your business documents and files, please contact us by phone or fill in the form on the page.